It can be said, unofficially, that Brooks Brothers is the outfitter of choice for the President of the United States. Since our founding in 1818 we’ve dressed virtually all of the Commanders-in-Chief dating back to James Madison. Decades later, when our country was engaged in a struggle for its very existence, Brooks Brothers stepped in to dress its beleaguered national leader. From the bustling streets of 19th century Manhattan, to the steps of the Capitol Building and ultimately, to Ford’s Theatre—the intersection of Abraham Lincoln’s history with us remains one of our greatest legacies. In March of 1865, Brooks Brothers was commissioned to create a coat for Abraham Lincoln on the occasion of his second inauguration. 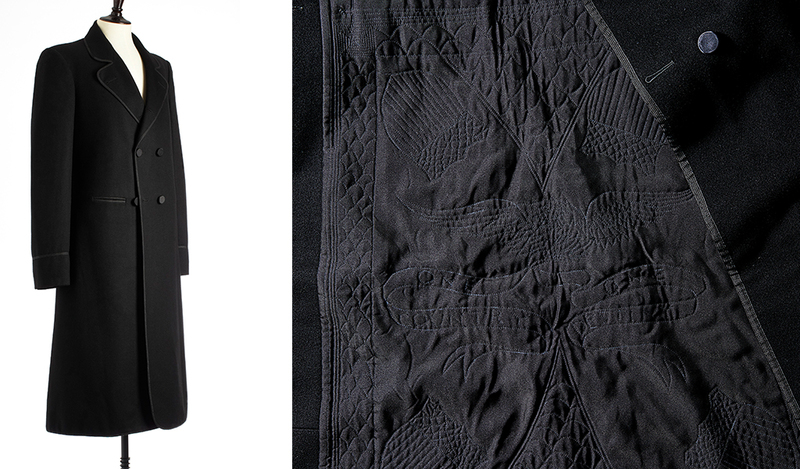 This custom black frock coat was specially measured for his lanky frame and featured intricate silk twill embroidery on the inside lining. 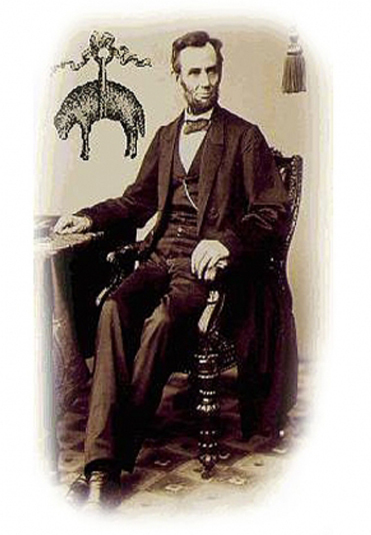 It depicted an eagle with a banner held in its beak that said “One Country, One Destiny.” It would serve as a prophecy for the country that would witness his assassination just weeks later—Lincoln would be wearing the coat that fateful evening at Ford’s Theatre. Intended to unite and heal the country at a time when it needed it most, this inscription speaks to a period of great change in American history and our undeniable place in it. The greatcoat would remain in the custody of Lincoln’s footman—and his descendants—Alphonse Donn until 1968, when it was given to Ford’s Theatre. In 1990, Brooks Brothers underwrote the cost of the restoration of the coat, which had begun to deteriorate greatly. While that original is preserved in sub-zero temperatures to this day, several replicas were created—one is held at the theater and another in Brooks’ archives. 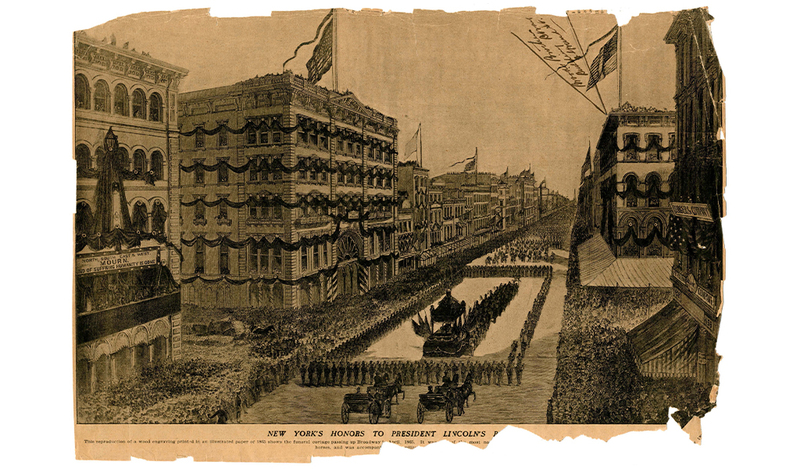 When Lincoln’s funeral procession ultimately came through New York City, it passed by Brooks Brothers’ store (which opened in 1858) at the corner of Broadway and Grand Street. The staff, accustomed to working with Lincoln over the years on his trips to be fitted, politely saluted him as he passed. A mirror that he used during his fittings at this store is still on display on the fourth floor of our flagship store at 346 Madison Avenue, serving as a reminder that we spent 200 years dressing all Americans, even those who occupy the highest office in the land. Our relationship with President Lincoln is just one chapter in the ongoing story of American style—from FDR and JFK, to Hollywood and the Ivy League. Click here to learn more about Brooks Brothers’ comprehensive history.